Yellow Dock root is considered to be a tonic-like herb that has been used to cleanse the toxic waste from the system and it helps to relieve virtually all disorders associated with impurities in the blood. It promotes clear, healthy skin and alleviates hives, pimples, boils, eczema, psoriasis, and acne. It is an excellent blood builder, and its iron content is easily digestible. It has been useful for anemia and iron-deficiency symptoms. Yellowdock has a stimulating effect on the liver and the gallbladder. It has been used to treat jaundice, hepatitis and other liver disorders. Its laxative effects promote good colon health, easing constipation, clearing bodily wastes and improving skin eruptions caused by constipation. As a blood cleanser, it is often used for the treatment of skin diseases such as psoriasis, herpes eruptions, eczema, boils, hives and acne. Moreover, its rich iron content helps to enrich blood quality and relieve anemia. The blood cleansing properties of Yellow Dock make it an outstanding tonic for healthy skin and virtually all disorders associated with impurities in the blood, including rheumatic conditions, glandular tumors, swellings and lymph gland enlargement. 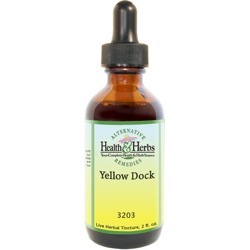 Yellow Dock has been used internally to treat bleeding of the lungs, dysentery and hemorrhoids. When applied topically in ointments and poultices, it relieves itchy skin, scabies and ringworm. The herb has been added to tooth preparations to improve spongy gums and to gargles to relieve laryngitis. Ingredients: Yellow Dock Root, Structured Water, 20% Alcohol. Non-Alcohol: Yellow Dock Root, Structured Water, Vegetable Glycerin. Contraindications: Yellow Dock contains oxalates and, therefore, should not be used in excess, especially for those with a tendency to rheumatism, arthritis, gout, kidney stones and hyperacidity. Excess use (many times the recommended dosage) may cause dermatitis and nausea, and using too much Yellow Dock or using Yellow Dock for too long may cause difficulty in having a bowel movement without the use of some laxative or promote low potassium in the body. Speak with your doctor before using Yellow Dock if you have an intestinal or bowel blockage or have had kidney stones. From Sophia Leva-Marie of Scituate, Massachusetts on 4/13/2018 .